It takes a lot for some people to take action. It takes a major event sometimes before someone will pick up the phone and seek help. Sometimes it’s in the form of a lawsuit served by a Sheriff to the front door. Other times, it’s a notice from the Secretary of State that the driver’s license is about to be suspended. Other times, it’s a notice from the city of Chicago stating that the vehicle is going to be booted, towed, and impounded if debts are not paid. Whatever the motivation behind the filing is, meeting with your attorney and getting your case filed is really just the start. You must make it to your 341 meeting of creditors. You would be surprised as to how many people file a chapter 13 bankruptcy case and then never appear before the trustee to be examined. They simply find an excuse or a reason whereby they cannot attend the court date. In those situations, we can often request and obtain a second meeting of creditors date. However, if that meeting is missed as well, the trustee is going to bring a motion to dismiss the case. Let’s say you do make your meeting of creditors, either the first or the second one, what you do next is important. Are you making your monthly payment to the trustee? If you’re on payroll control, has your deduction started? If the deduction has not started, are you making the payment on your own to make up for what should have come out of your pay? What I’m demonstrating is that there is a lot more than just filing the case and appearing before trustee. You have to stay aware of the circumstances surrounding your case. You have to follow through on requests that your attorney makes pursuant to a trustee’s request. Many times after the first meeting of creditors, the trustee is going to want specific amendments or see documentation related to certain expenses. You as the debtor have an obligation to get that information to your attorney as soon as possible so that it can be forwarded to the chapter 13 trustee. If the trustee doesn’t receive what they request, it’s another reason to deny confirmation or motion the court to dismiss your case. 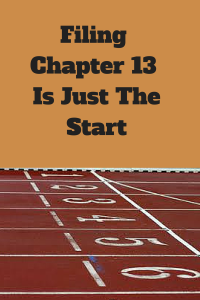 Chapter 13 is a process with many steps along the way. The filing of the case is just the beginning. The meeting of creditors is necessary, however just another step in the process. The important item is that the trustee gets paid every month pursuant to the plan proposed by you and your attorney. If the money is supposed to be coming out of your payroll and it is not, you have the obligation to make the payment on your own until such time that you see it coming out of your check. Countless cases have been dismissed for failure to pay the trustee and the client said “I thought that it was coming out of my payroll.” Yes, it was designed and set up to come out of your payroll with a proper federal court order. However, your employer did not honor that order or was negligent in handling the order. You as the debtor need to be aware of what is coming out of your pay and what is not. You have an obligation to look at your paycheck stub and see the deduction as it relates to chapter 13. You basically cannot bury your head in the sand and just walk through your chapter 13 case blind. You have to stay vigilant, aware, educated and empowered. Thus, filing the Chapter 13 case is truly just the beginning of a long journey or repayment.